Kitchen Countertops Granite Countertops My granite counter has lost its shine - How can I restore it? As they have become highly popular in kitchens worldwide, granite countertops are currently designed to come in a wider range of colors, all with high-end looks and enhanced durability. However, a granite countertop, just like any work surface, needs special care in order to maintain its original shine and functionality. For instance, if you do not take proper care of your granite countertop, its surface can easily become lifeless and dull. Luckily, you can restore its original shine with just a little effort and time. Here are the best ways to bring your granite countertop back to life by restoring its shine. All you will need is a liquid dishwashing detergent or a granite-safe cleaner, a micro fiber cloth and quality granite polishes. Start by thoroughly clean your granite top with the micro fiber cloth and cleaner before starting to polish its surface. Make sure that you use a granite-safe cleaner or a liquid dishwashing detergent that is pH-neutral. For instance, harsher chemical cleaners are very likely to dull the natural shine of a granite countertop and this is the main reason why you must go for the right type of cleaner for your granite countertop. Next, once your countertop is clean and dry, you will have to apply the chosen granite polish – make sure that you apply this polish to the entire granite surface. The manufacturer’s instructions are to be followed in order to apply and remove the granite polish in the right way. Granite polish is designed to protect the granite surface from cleaners, alcohol and food acids that can burn this natural stone. 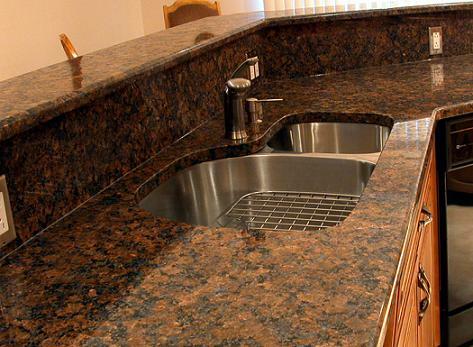 Also, such granite polish will prevent any ring from kitchen glassware from forming on the granite surface. Next, you will have to use some clean water and rinse off any excess polish residue. Make sure that you buff away any possible streaks or smears by using the micro fiber cloth. You can maintain the shine of the granite countertop by cleaning its surface on a daily basis – use granite and food safe cleaner in order to do this. Proper cleaning and care will definitely prolong the lifespan of the granite countertop as long as you repeat this whole polish treatment whenever the granite countertop starts to look really dull. Also, you will have to make sure that you clean up any spills, especially liquids, immediately. Hot dishes or pans must not be placed directly on the granite countertop as their heat can scorch its surface. Make sure you wear some quality protective gloves when you’re using the granite polish.